I’ve been experimenting with growing hardy Rhododendrons and Azaleas in my garden here in the hills of Hinesburg for over 25 years. 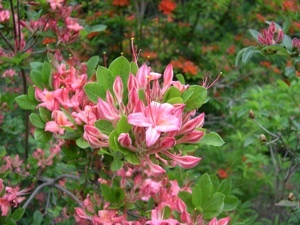 Azaleas are technically members of the genus Rhododendron. Those species hardy in northern zones are typically deciduous, loosing their leaves in the fall . We grow over 25 species and cultivars of Rhododendron, and depending on the type, bloom from early spring till mid July, many with wonderfully fragrant blooms. Below are a sampling of some of our available plants.